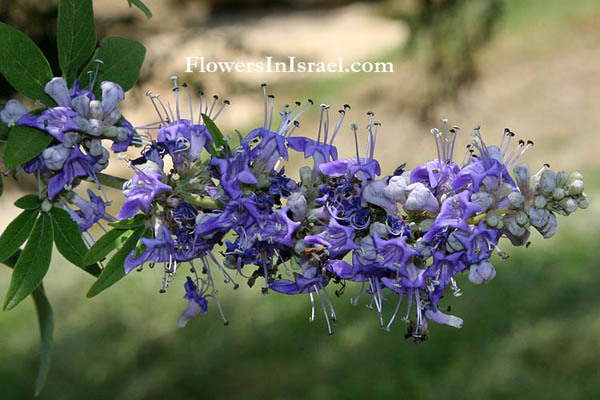 Scientific name: Vitex agnus-castus L.
Vitex, Latin, vitilis "made by plaiting", because the flexible branches of the tree were used in the construction of plaited fences (willow has similar seman­tics). agnus-castus, agnos, αγνοϛ, lamb, chaste, pure, holy; us, Latinizing suffix; castus, chaste, pure; chaste - chaste. In ancient Greece, the tree was called agnos [ἄγνος], which apparently the early Christians confused both with a similar Greek term hagnos [ἁγνός] "chaste", and with Latin agnus "lamb", the Christian symbol of purity. The English name for the tree is chaste tree or Dutch kuisboom. 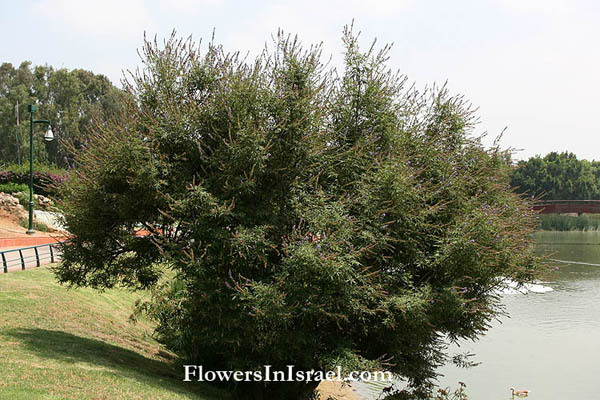 The Hebrew name is siah avraham (שיח-אברהם) "Abraham’s bush". The standard author abbreviation Lebas is used to indicate Carl Linnaeus (1707 – 1778), a Swedish botanist, physician, and zoologist, the father of modern taxonomy. The standard author abbreviation Carrière is used to indicate Elie-Abel Carrière (1818 – 1896), a French botanist. The standard author abbreviation Stokes is used to indicate Jonathan S. Stokes (1755 – 1831), an English physician and botanist. In antiquity the tree was known for its numerous medicinal qualities; according to Aelian and others, some of these qualities were related to the sexual life of women, associated with the opposing categories of chastity and fertility. On one hand, the leaves of the tree were reputed to temper sexual desire; thus the couches on which the Athenians who observed sexual continence during the Thesmophoria lay were made of agnus castus branches. 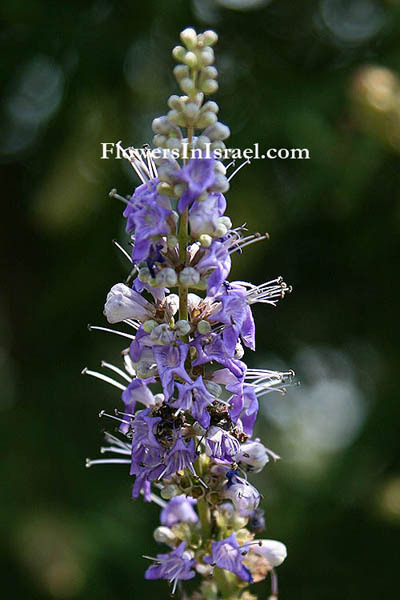 On the other hand, the same agnus castus was known to favor menstruation and lactation. Seemingly opposed, these qualities are really not contradictory: the period of fecundity in women is incompatible with the development of an excessive sexuality. Thus the agnus castus can control sexual impulses while stimulating the powers of bleeding and hence of fecundity in a woman. According to Greek mythology, the goddess Hera was born and nursed beneath a sacred chaste-tree on the island of Samos. The Vitex agnus-cactus was sacred to Hera (associated with marital chastity, sacred tree in her Samian temple), Hestia (virgin priestesses carried chaste-tree stems), Artemis (Spartan statue bound in withy stems), and Demeter (matrons strew their beds with flowers of the tree during the Thesmophoria - a festival, in honor of the goddesses Demeter and her daughter Persephone). Pausanias (143–176 CE, Greek traveler and geographer), Paus.3.14.7: The sanctuary of Agnitas has been made on the right of the Course; Agnitas is a surname of Asclepius, because the god had a wooden image of agnus castus. The agnus is a willow like the thorn. Not far from Asclepius stands a trophy, raised, they say, by Polydeuces to celebrate his victory over Lynceus. This is one of the pieces of evidence that confirm my statement that the sons of Aphareus were not buried in Sparta. At the beginning of the Course are the Dioscuri Starters, and a little farther on a hero-shrine of Alcon, who they say was a son of Hippocoon. Artemis was also called Lygodesma because her xoanon was found in a clump of agnus castus trees (vitex or agnus castus) growing near the water. The trunks, explains Pausanias (Paus. 3.16.11), kept the statue upright (ὀρθός), whence the double epiclesis of Lygodesma and Orthia. Ground seeds of the Vitex agnus-castus were used in monasteries as a condiment to suppress libido, hence the common names, "monk's pepper" and "chaste tree". The fruits have hormonal effects on both men and women, inhibiting male androgens, and increasing female progesterone, although it is not exactly clear which constituents are responsible for these effects.